1 For the dough, crumble the yeast in a bowl, stir the sugar and 175 ml (approximately 3/4 cup) of lukewarm water and stir until smooth. Combine the yeast with the flour, olive oil and 1 teaspoon salt and knead to a smooth dough. Cover and let rise in a warm place for at least 1 hour. 2 Preheat the oven and a baking sheet to 240°C (approximately 465°F). 3 Rinse the figs and cut into wedges. Grate the cheese. 4 Knead the dough again on a floured work surface and divide into 4 portions. Roll each portion into thin ovals. Place on baking sheet and sprinkle with the cheese. Top with the figs bake until golden, about 10 to 15 minutes. 5 Rinse, trim and dry shake the arugula. 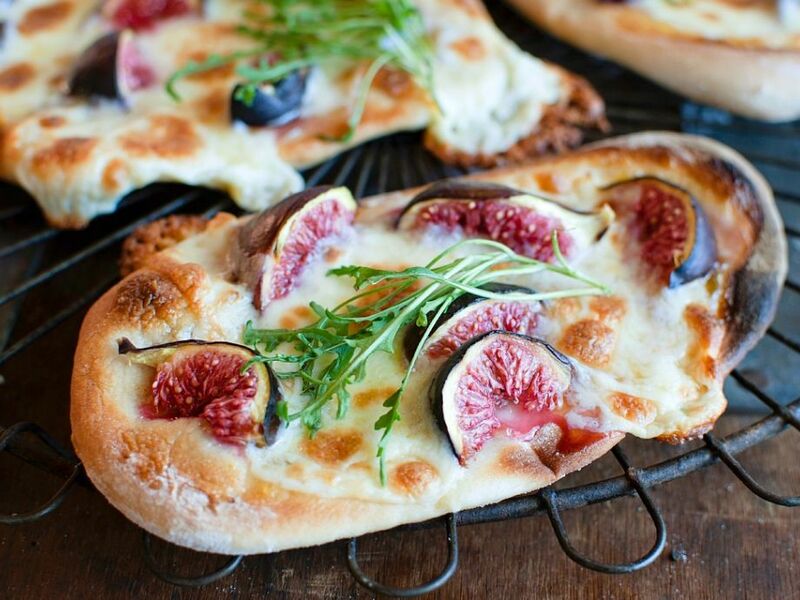 Take the flatbread pizzas from the oven and serve garnished with arugula.